I want to be able to support all input devices. Ones that exist, ones that don't exist yet. Ones that you make yourself. So I have come up with a system to do that. It relies on using HID and USB. These types of devices just supply you a bit stream and you have to work out what it means. So that is the first stage. I will write a tool to make this easy one day, but for the moment I just use a hacked together tool modified from an excellent HID library on the web. I select the device I am interested in and you get a real time display of the bytes. Then I start wiggling the controls and pressing buttons to see what changes. So 10 bits for the left throttle ... 10 bits for the right throttle .. etc. Once you have this you can use that to create an input device in the game. 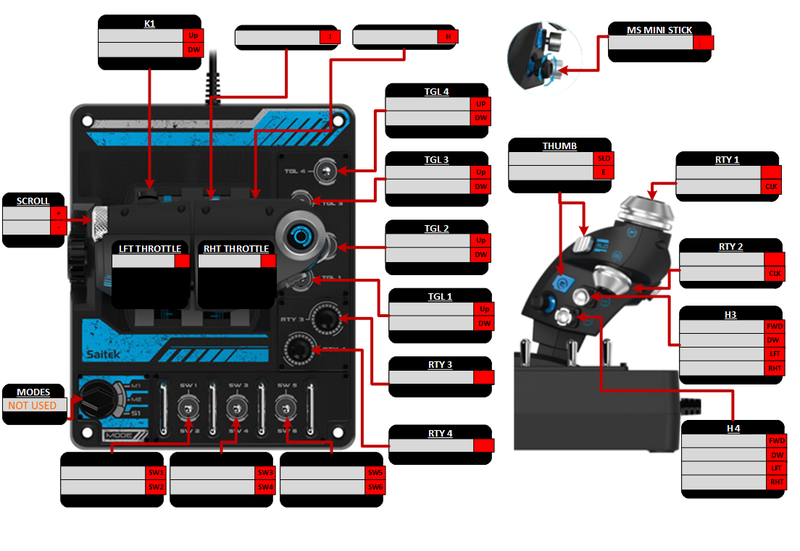 It has support for buttons, throttles, sliders, thumbsticks, hi-hats, and clickers (like a mouse wheel). The size doesn't matter, the code has scrolling support. The important thing is to have a window for every input. Then you need to create a text file. This links the image to the code. Now you can load it in the game. The in game procedure is simple. Move a control or press a button and it is lit up to show you it has been detected. Then select an aircraft specific event you want to map it to. The event list will be extracted from the aircraft's gameobject. Well it will be eventually, at the moment I am still building up all the key events and supporting components, but that's another story. The list on the right is a folding scrollable list to make it easier to navigate. I've been working "on the other end" of the USB/HID connection lately in my "Switchbox" project. One big part of that project was to get the device recognized correctly for the PC, which involved dealing with the HID/USB protocol. 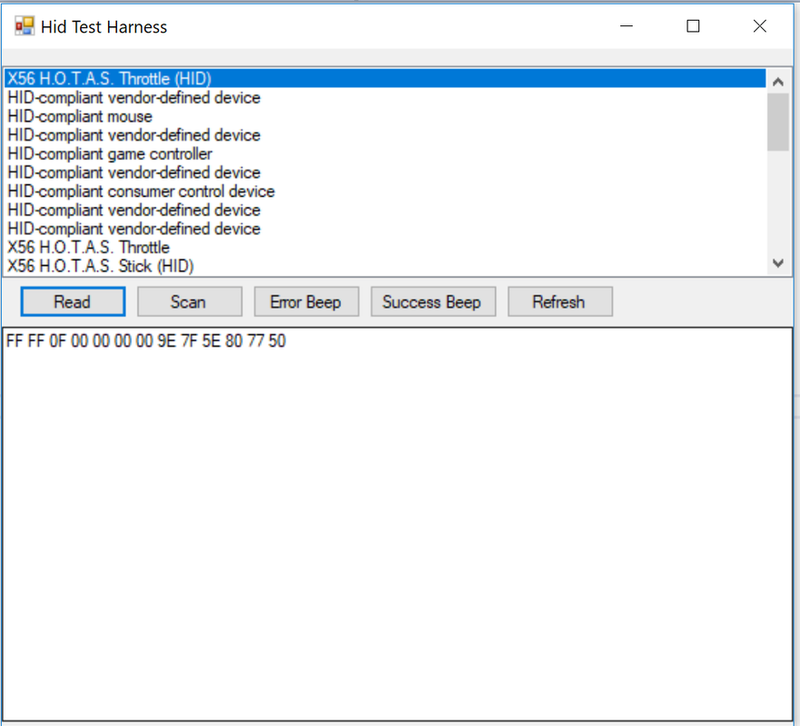 In usb.c you will also find the HID report descriptors which define the device's internals for the windows HID driver. I'm not sure whether you can get access to the report descriptor at runtime, but if you could, all the information needed to distinguish between the different controls found on a joystick can be taken straight from that descriptor. This would also solve another issue you might stumble upon: Padding bits. Because if your data telegram doesn't fit to a 16-bit boundary, you will have to use padding bits to make it fit to that limit. If you only read the data stream, the only way to identify padding bits would be to look for bits that never change when you press buttons - but that could be misleading, because from a programmer's point of view, I could write bits into the padding area at will, so it's no given that they'll never change. That's worth having another look at. 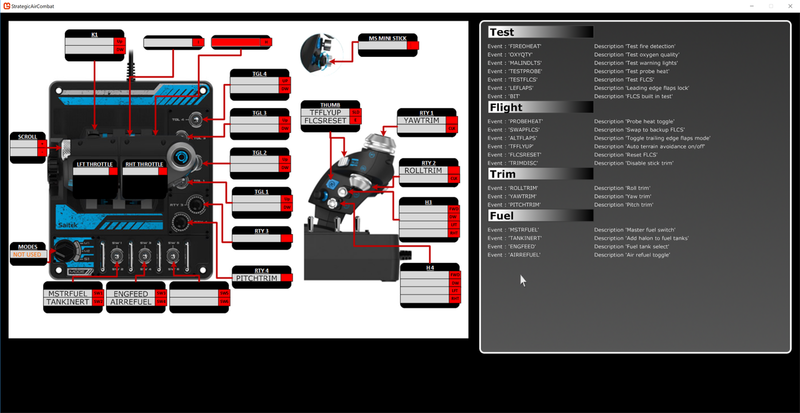 I looked at the descriptor for the Saitek throttle, and it did not match what I was getting. Maybe the reference I was using was incorrect. At the time I couldn't be bothered debugging it when I had a simple solution. Well Mike, I really wish you hadn't mentioned that. I went back to the code and looked again. The documentation implied you could just call a function and get a report back which defined everything... you can't. That part of the USB code seems to have just filtered away. So I went to other functions to see what I could get. I found that I can call HidP_GetValueCaps and HidP_GetButtonCaps to find out what it was reporting. So I modded the test harness and got this. This is a standard Xbox controller. You can see the right joystick (RX,RY), the left joystick (X,Y), the right trigger (Z), the 4 way hatswitch, and 9 buttons. So where is the left trigger? It's gone. Disappeared. Shuffled off it's mortal coil and joined the choir invisibule. So now I have to dive even deeper into the morass that is HID to try and figured out what the hell has happened to that. The device has 16 data indices, 9 buttons plus 7 input values... but I only have 6 input values. Which means automatic detection is not totally possible. There will be exceptions that don't work.